Well we won some and we lost some of the applications shown on the map below. Overall there have been around 100 permitted houses in the last couple of years (despite the village survey saying that nobody thought that number was appropriate). There are still applications coming forward and we are trying, through the local plan, to protect remaining green areas. The construction of these 80 houses simultaneously is putting a strain on our village roads. We have asked the District Council what planning conditions were included in relation to site traffic. They have told us that all traffic associated with the 3 sites are required to park on the relevant building site and wheel washing machinery is required to be in place so that there should be no mud on the surrounding roads. In addition, the route to be taken to (and away from) the Measham Rd site is along the Tamworth Rd and down Measham Rd. For the Top St / Botts Lane the route is along the A444 and down New Rd. See below for maps. There hasn’t been an agreed route for the smaller Top St site yet. This is now being addressed by planning officers. This means that there should be NO construction traffic on Bowley’s Lane, Rectory Lane, Snarestone Lane, Church St, Black Horse Hill, Stoney Lane, Mawby’s Lane, Botts Lane, Duck Lake or any part of Measham Rd or Top St closer to the village centre than the building site. So if you see site-related traffic parked on the road, mud on the road, or traffic on non-designated roads you can contact the Planning Enforcement team at environmental.protection@nwleicestershire.gov.uk and do let us know as well! 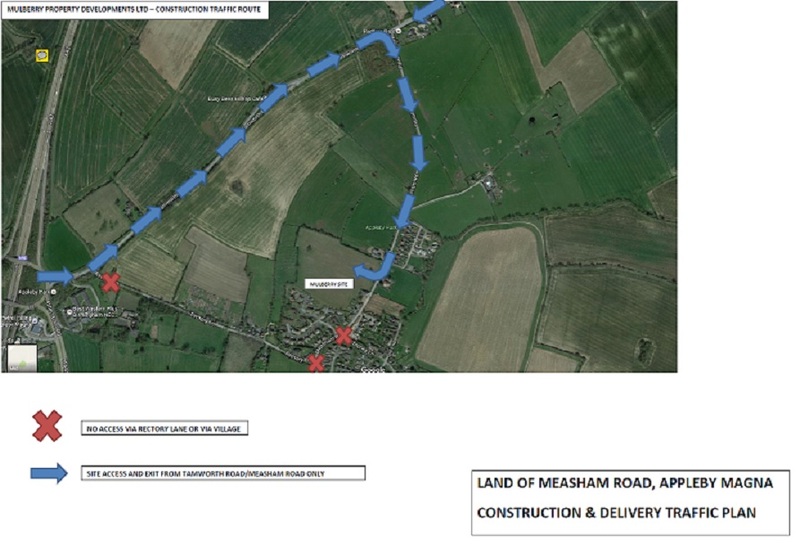 Here is the agreed route for vehicles coming to the Measham Road site. The agreed parking / delivery area for the site is on the part of the field without planning permission. The developers are required to reinstate this after the development is complete. Here is the agreed route for the Top St / Botts Lane development. Given this plan (and a detailed document saying it will be communicated to all site personnel and contractors) we wonder why there are signs to the site as one approaches the village along Snarestone Lane! If you want to find out more about these applications you find all the documents on the North West Leicestershire website. We have created a document which explains how to find these which you can download here (pdf format). There are a lot of documents for each application but the file names give some guidance as to what they are (try planning statements, design & access, location plans for overviews). The document also explains how you can make your objections online (You don’t need to do it that way – letters by post or email to the planning department are fine). If you do make objections through the onine system you will need to register and do a separate submission for each application. You should also send a copy to our District Councillor Richard Blunt at the same address or by email to richard.blunt@nwleicestershire.gov.uk . You can also contact our County Councillor Heather Worman heather.worman@leics.gov.uk about issues affecting county council responsibilities such as flooding and transport. See the link at the end of this page or recent news items for relevant arguments to make. For objections to be effective they need to be made on valid grounds. A good guide from the Royal Town Planning Institute is available here. Click here to download a summary document which explains who to write to and also lists relevant arguments to make. 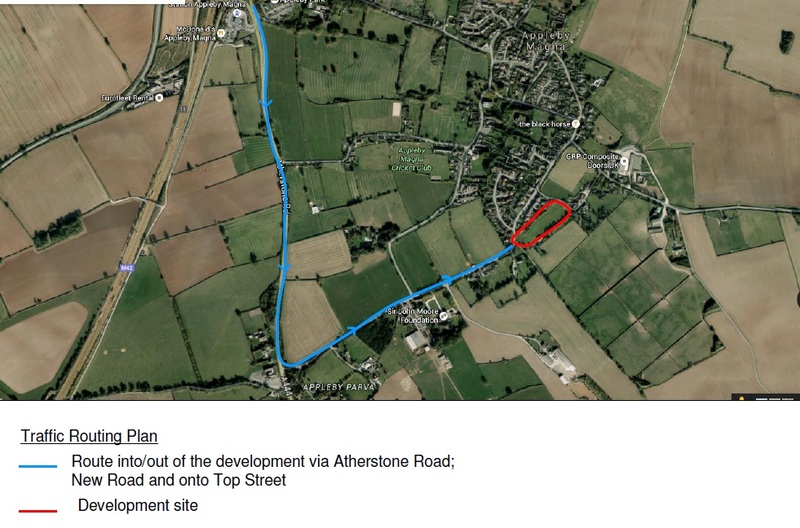 Planning Committee Meeting 4th February, 2014 approved an application for 8 houses on Measham Road/Stoney Lane. The good news is the application for 25 houses at the junction of Church St / Bowley’s Lane was rejected. However they did approve 39 houses on Measham Rd and 29 houses at Top St / Botts Lane. This is very disappointing and we feel that the officers and councillors failed to understand or consider our arguments about sustainability. However, unlike developers, we have no right of appeal. On the positive side the committee did stress that they felt that this would complete the number of houses that Appleby could be expected to absorb in the current plan period. 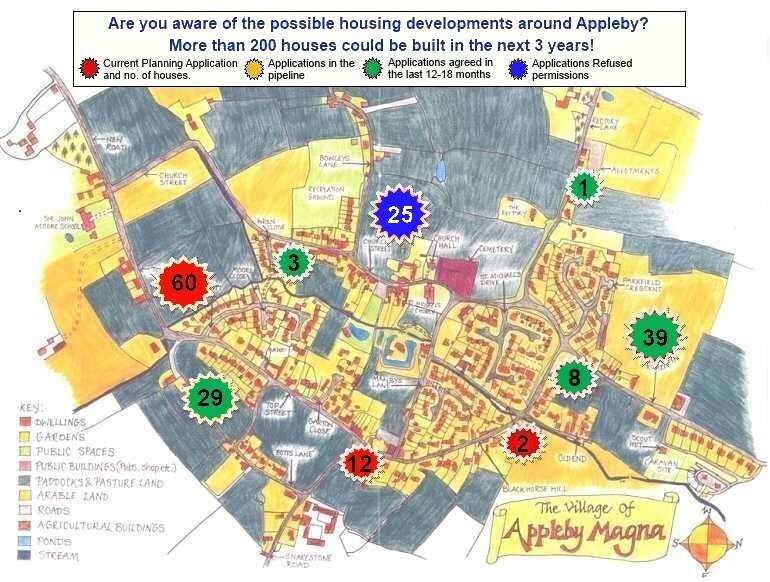 The Ashby Times (11th April 2014) quotes Councillor Pendleton as saying “The applications approved in Appleby Magna since 2006 now constitutes an increase in growth of 22% which is in line with the desired level of growth for the district”. Let’s hold them to this commitment not to approve further undesired housing in our village! 60 houses on Top St / Didcott Way, still being assessed. Please send objection letters as soon as possible (see news post for arguments). This is expected to come to the Planning Committee in June or July. 12 houses Top St / Snarestone Lane – this is where 3 housing were previously approved. They have now decided they would rather have 12! (see news post for arguments to make).